Being that this one was on home turf, I knew that it was going to be a considerably different experience. Gone from this conference would be the sense of adventure that comes from exploring a new wine region along with the likelihood that I would suddenly find a new wine or style that I’d never tried before. Faces were more familiar than not but I still got to meet a lot of new people and connect with others that I’d only ever interacted with online. For the speed-tastings, I had met, worked with, or interviewed every one of the winery personnel who were pouring the samples. That’s the luck of the draw for the speed-tastings because where you sit in the room determines which wineries you get to taste and perhaps there were plenty there who I may not have met or tried their wines previously. So the adventure of tasting new wines from a new place was not there for me this time, but I wasn’t really expecting that from this conference anyway. What I was really hoping to see was how the industry here was received by all of the conference attendees who had never tried BC wine before. Overall, I am very proud of the BC wine industry in showing how well that we can come together as an industry to show the adventurous, eager-to-learn, wine bloggers from all over North America what a great place this is to make wine. 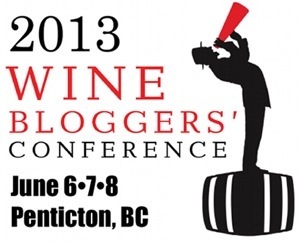 As proof, this conference was rated by its attendees as the best Wine Bloggers Conference yet! It was also a new experience for me because I was asked to present a session on podcasting along with Melissa Voth-Mchugh (photography) and Monique Soltani (video) for session called “Videography, Photography, and Podcasting.” I’ve taught music for 2 decades and have helped others learn about wine for 7 years or so but never has anyone asked me to show them about podcasting or even recording. It seems strange but putting into words (or in this case, a PowerPoint presentation) something that I’ve just done since I was 16. My dad had a home recording studio since I can remember and I started making use of it myself when I was old enough. So it’s always been just something that I’ve done and not really shared with anyone else before. I love new experiences like that for, the challenge alone, and for that I am extremely grateful. If you haven’t yet heard the podcasts that we recorded that day, please check them out here and here. Both groups were very interested in podcasting and I hope that they can begin to create their own at some point in the future. I was truly amazed at how far some people in the podcast group had traveled to come to the conference. As I edited the audio from those sessions, I found that I really enjoyed listening to all of the accents from all around North America. I was also really happy to see that the session on “Videography, Photography and Podcasting” was one of the highest rated sessions at the conference. I’m also grateful for getting to meet new people and try new things. I chatted about Pinot Noir with Dan Sullivan, winemaker at Rosehall Run in Prince Edward County. I tasted through 8 South African Chenin Blancs and was part of the first group of people outside of the 4 members of the wine making team in France to taste a deadly new Gamay blend from Georges Duboeuf. I tasted wines from Uruguay for the first time. I learned about Nomacorc’s amazing synthetics corks. There was so much information there that I felt drunk on that rather than any amounts of wine that I had the opportunity to taste. That in itself makes the Wine Bloggers Conference worth every penny for me. It’s an almost adventurous thirst for knowledge that seems to be a common denominator among many of the attendees and this conference in particular straddled that line extremely well. One of the most special experiences for however was getting to experience the new wine caves at Seven Stones Winery in Cawston for the Friday evening excursion. I had heard about its planning for at least a year or more before it actually began construction. I remember vividly standing in the cold of January on the dirt at the bottom of where the barrel lift is now, looking up through the trusses that were going to support the concrete forms at George’s house. I’ve never been able to look up at someone’s house from 25 feet below the ground and the perspective was amazing. It was a truly special occasion for me to be present at the first function to be held there and I’m so glad that I was there in person. This will be my final blog post on the Penticton Wine Bloggers Conference although another podcast is not out of the question since I still have a small amount of audio that remains unedited at this time. Thanks to everyone who participated, organized, and otherwise took part in the Penticton WBC13 and to the great gang of podcasting peeps from my session. Luke, that is an excellent wrapup and it is nice to read your BC-specific views of the conference. I agree the BC wine industry did itself very proud and those of us coming from south of the border left quite impressed. We appreciate you taking the time to talk about podcasting – believe it or not, that was the first presentation on podcasting we have had at any of the WBC events in six years!